Joanna Jast knows a little bit about Focus. So much so that her first book Laser-Sharp Focus: A No-Fluff Guide to Improved Concentration, Maximised Productivity and Fast-Track to Success, quickly became an Amazon bestseller. But as with a lot of success stories, the effort behind them is often born out of a frustration. Joanna wasn’t satisfied with the way she was working, and she was becoming increasingly tired of the same old productivity advice. This led her on a journey that took her down the path of books, courses, and scientific journals, and really revolutionized the way she understood focus. I thought for a change of pace I’d reach out to her and try to delve into the psychology of attention, and get some actionable tips and advice on eliminating distractions and improving productivity. Side Note: Joanna has created a Free Laser-Sharp Focus Quick Action Guide for Project Monkey Mind readers that you can get here. I was going through a period in my life when I needed to really ‘up the game’ with my focus and productivity. I realised that ‘what got me here wasn’t going to get me there’ – I needed a new system to shape up. I started searching for strategies but all I could find was a lot of superficial, generic advice, a lot of what I call ‘inspirational-motivational fluff , praise for meditation (which has never worked for me), and other advice I doubted would be useful in my case. I knew I didn’t have a problem with my motivation- I was motivated to improve my focus. I was also quite aware what had worked for me and what hadn’t. Little point in telling me ‘you need to motivate yourself to fight your procrastination’ or ‘try meditation and your productivity will soar’. I didn’t want to waste my time, effort or money on something I knew had little chance of making a difference. So I started going deeper in my research. I started reading academic papers and science-based books on focus, concentration, attention and brain functioning in general. At the same time, I started running my own little experiments, putting the scientifically-verified strategies in practice. And while searching for answers, I quickly realised I wasn’t the only one struggling with poor focus and poor quality focus advice. The problems people reported on Quora or in response to my questions were quite similar to mine, so I decided to create a free email course. The course was quite successful, so I decided to expand it into a book. And that’s how Laser-Sharp Focus book was born. Do you have any advice for conquering social media? Do you think it’s useful to use as a reward, or do you have a never during work hours policy? I’ve been through stages with social media. In general, I agree that social media can damage our productivity on multiple levels – notifications can be really disruptive to our focus, but the emotional effect of some posts can linger on for hours, making it difficult to fully refocus on your task. On the other hand, in times of struggle, when you’re working on a really long and monotonous task, and you’re craving some positive (or any) emotions to fight off the boredom, social media can provide oh-so-needed distraction and a bit of a booster to your motivation or creativity. So yes, I can see social media/email checks can be useful in keeping us going – particularly as an extrinsic reward, but only as long as the payoff is bigger than the cost. I generally don’t allow myself to check social media or other distractions while I’m working. I do it during breaks and also sometimes when I’m really stuck and particularly struggling with boredom or a mental block. I do have a strict policy to only engage with a post, email, message etc, if it takes less than 2 minutes and is unlikely to negatively affect my emotional state. If I suspect otherwise, I don’t touch it or just tag it for a follow-up later. I also allow myself to access only certain sites while I’m working. In your book, you talk about how “getting motivated” is unreliable and overrated. How do you feel your attitude towards motivation differs from most of the advice out there on the subject? 1. First of all, I assume that since you are reading this post, you understand you have a problem with focus/procrastination etc., you want to fix it, and you are looking for answers – to me it means that you are motivated. You don’t need to ‘motivate yourself’, you just need to find the right way of using your motivation to help you solve your problem, for example – your focus. And it is NOT through using the motivation to focus on your work, but using your motivation to build a system that will get you to focus every time you need. This way you eliminate all those endless and exhausting cycles of having to motivate yourself every time you need to work. Set it and forget it! 2. The second thing I do differently when it comes to motivation, is the insistence on understanding what truly drives you in life and embrace it. And by that, I mean not what you think, or what you would like to be driven by, but what really lights your fire. The more I work with people, the more I talk to my readers and clients, the more I can see that many of us (I was there as well, until quite recently), live believing that we are motivated by something we really don’t care about. Because we have been told to be motivated by it, or because we want to aspire to something bigger, or because we want to please other people… for all sorts of reasons. But sadly, even if you are working towards your own dreams, but for the wrong reasons (the reasons that don’t light your fire), your motivation is bound to run out. And when your motivation runs out, what’s the first thing you think you need to do? ‘I need to get motivated again’. And you start the never-ending, exhausting cycle of getting motivated and burning out. And that’s how you end up being unmotivated, disillusioned, with a starved soul and even a burnout. But if you can discover what really lights your fire, however unworthy this may sound to other people, and plug right into it, you can say bye-bye to motivation problems forever and skyrocket towards your goals. You emphasize how important it is to have a distraction-free workspace. What are some things that are often overlooked when it comes to creating an environment that promotes focus? Noise. I can’t stress enough how distracting and destructing noise can be. Noise not only acts as a distraction but also it causes tiredness, headaches, irritability and other health problems. Many people swear by focus or productivity boosting music. The research into that matter I have done tends to say that music, particularly music with lyrics has negative impact on focus and productivity. It’s definitely my case. I know there are people who disagree with it. So I’d say test what works for you better. I’m a huge fan of the web app Pocket for stopping us from getting distracted during the day with articles. Do you have any apps that you recommend for getting stuff done or stopping us from getting distracted? I don’t really use productivity apps. I use Evernote for documents and books I want to read on the go. I have a system (it’s a pen and paper system) to capture any thoughts and ideas that pop into my mind while I’m working. I just jot it down and put it on my calendar to look at when I review my to-do things (morning and evening). The 2-minute rule I mentioned before is part of it. This is something I adopted from David Allen’s GTD (Getting Things Done) system. It’s very effective. I know my thought is safe and I stop thinking about it. As for other things that can potentially distract me during work, as I said before I have developed a system where I only allow myself access some sites. I don’t even use site-blocking software – I just rely on my laziness and poor memory. A while ago, I purged my favourites and history and my FB feed of any sites with stuff that took longer than 2 minutes to read. I can still go there and read if I want, but I’d have to type the name into the browser. And because more often than not I don’t remember the address, I have to do a search and that takes time, and I’m too lazy to do that, so I don’t do it unless I really want to and have more than 2 minutes. I’ve found that with procrastination there isn’t a one size fits all approach. For example, I’ve noticed I’m very driven by things I believe are taking from my time and my life – I don’t like excess fat. I realised that when I highlighted exactly what procrastination was taking from me, it greatly reduced the amount of time I was wasting. In your book, you underline the importance of finding out why you procrastinate – what are some of the most common reasons people procrastinate that our readers might see in themselves? I agree with you – it’s very important to understand why you procrastinate in the first place. Otherwise, you’ll be just shooting in the dark, wasting your time and energy on strategies or tactics that are unlikely to work for you. Each of those root causes would require a different approach to really address the problem. So if any of you, dear readers, are struggling with procrastination, I encourage you to explore what it really is that’s driving it and address it with bull’s eye precision. You touched briefly on attending to your spiritual needs when it comes to managing your energy. For those that don’t have an organised practice or religion, this may come in the form of some higher goal. How have you found this to be helpful to the cultivation of energy and focus in your own life and work? To be honest, I am still in the process of figuring it out for myself. This is one of my goals for this year. The thing that I really want to stress is that spiritual energy comes from the soul and it is about feeding your soul. What is really, really important is to understand what feeds your soul. Because if you try to feed your soul with something your soul doesn’t care about, you’ll starve it to death. We all are different and different things ‘light our fire’. For some people, this will be about having a higher goal, for other – pursuing freedom, autonomy. And for some – it’ll be about mastery or achievement, or some other thing. And while it’s true that having a higher goal will fulfil spiritual needs of some people, it doesn’t mean it will work for everyone. Please don’t assume that pursuing a higher goal will solve your spiritual problems. Misalignment of motivational drivers, just as misalignment of values leads to burnout. So what I have found helpful is in keeping my spiritual energy up is to discover what really drives me in life, what’s really important to me, what feeds my soul, admit it to myself and then make sure that I do it. What was your own biggest issue with focus, and how have you overcome it? Actually, I’ve had quite a few struggles and I have been addressing them one by one over the years. The biggest issue, I think, is my low threshold for boredom, which coupled with difficulty in delaying gratification causes me to constantly fight off distractions, need for instant gratification, wandering mind and short attention span. I have created a number of systems that are built on solid foundations of knowing myself and relying on my environment for execution. There are certain principles I rely on, for example I never trust my future self and I assume that faced with temptation I will be likely to give in. So I create heavy-duty systems that can get me to do what I need to do in worst-case scenarios. If someone only had 15 minutes a day to improve their Focus, what would you recommend they do? Track your distractions for a couple of days. How? Every time you get distracted – write down: time of day, place, reason and cause of distraction – it takes about 10-20 minutes per day depending on how distracted you are and how good you are with logging, but this simple exercise can provide you with a better understanding of your focus problems. And once you know what affects your focus – apply a targeted solution. Additionally, just by paying attention to your focus problems, you become more focused! #1 Turn off all notifications. Enjoy the freedom! #2 Minimise noise. Put a noise cancelling headphones or close the door/window etc. For all of you who are serious about improving your focus, I have a free Laser-Sharp Focus Quick Action Guide, full of useful tools to help you identify your focus problem, Laser-Sharp Focus Roadmap with tips on what strategies may work for you, and a lot of other useful things. Excellent advice. 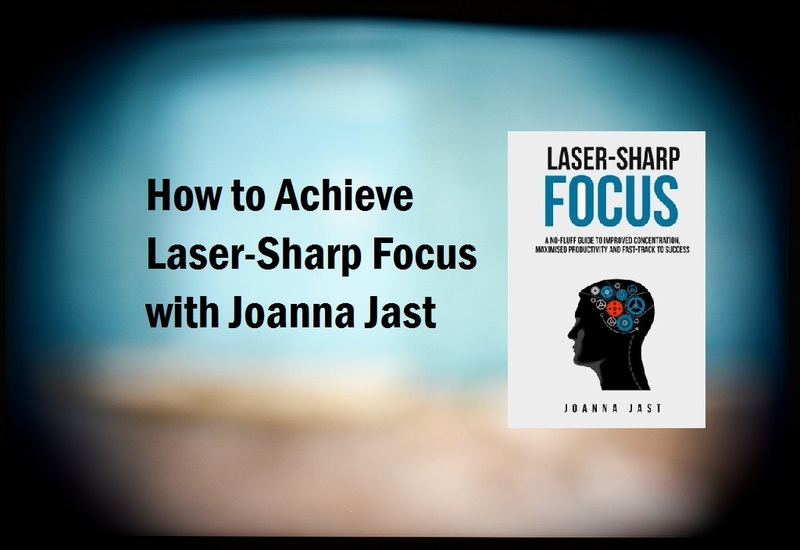 Joanna Jast has become my Focus Hero.